home pages for the individual lawyers. For some years, a database of cases pending before the Court of Appeal was availbale as well, until this was taken over by the Government. The web site proved highly succesful. The public web site is intended for the general public. Apart from the general information on what the Bar Association is, and what it does, it gives a lot of information that is useful to the visitors: it explains, e.g., under what circumstances people can get a Government paid ("Pro Deo") lawyer if they can't afford one. Or it shows how lawyers' fees are calculated (! ), or what people can do if they think their lawyer is overcharging, etc. This FAQ has proven quite successful. The web site also includes monthly updated lists of lawyers that can be downloaded as PDF files. These, too, are very popular. 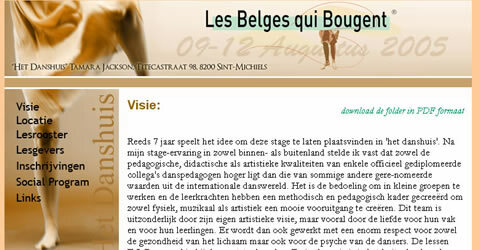 View the site at http://www.balieleuven.be. The database of lawyers is a part of the public web site, but is worth mentioning separately. Apart from the usual searches on name, or city, it allows the user to find a lawyer based on the (self declared) field of expertise of the lawyer. If you need, e.g. a lawyer who specialises in computer law, the database will not only tell you what lawyers have expertise in the field, it will even allow you to find the one that lives closest to where you live. Available since 1997, it probably was the first of its kind, and its functionality has since been copied by virtually all other bar associations. This database is updated once a month. See the database in action at www.balieleuven.be/databank.php. of pages with useful information. Apart from the publicly accessible parts of the web site, the Bar Association of Leuven also has its own private intranet / extranet. It contains information about deontology (professional ethics), about activities of the Bar Association and related organisations, as well as more practical information like contact details of courts, opening hours of jails, etc. Because laws are constantly changing, a system of continuing education is compulsory for all advocates. To this end workshops and seminars are conducted on a regular basis. Course materials are available in the extranet as well. As a bonus for the lawyers, a one-page web site with a permanent internet address (URL) is generated for each lawyer, with information from the online database. That way, lawyers who do not have a dedicated web site of their own, can still refer people to a web site for more information, and print this URL on their business cards, letter heads, etc. These pages can be found at http://advocaten.balieleuven.be.